Spanish Pretati is an iPhone app developed byDigital Avenues Limited. This video dictionary tool is a helpful tool for Spanish language students. There are tons of different Spanish tutorial apps on the iPhone. So, what does Spanish Pretati do to stand out from the crowd? They incorporate a video dictionary, of course! I’ve not seen any other language apps on the App Store that incorporate a video dictionary, but it’s a brilliant thing to do. Being able to watch someone’s mouth can really help you with your own pronunciation. Also, the videos let you slow things down, adjust the volume, and zoom in. Smart options, right? Spanish Pretati contains over 500 important phrases and words that international travelers will need most when visiting Mexico or Latin America. Phrase categories include Getting Around, Eating & Drinking, Health, Problems, Numbers, & Shopping and Money. Something that’s really smart about this app is the fact that it works offline! That’s great news for places where you don’t want to pay for data, roaming, or just don’t have a signal. Spanish Pretati is more than just an education tool. It’s a clever communications tool as well, because you can copy the phrases you are studying and then send them via SMS or email. 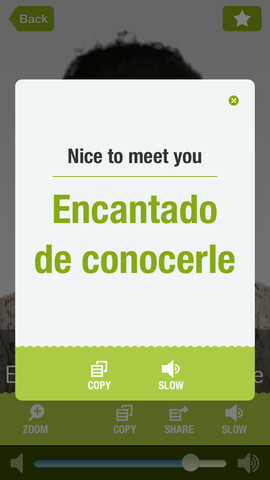 In addition to this Spanish app, Pretati also offers 14 other language apps (and 16 more are planned.) If there’s another language you want to learn besides Spanish, this is a company to keep a watch on. Overall, Spanish Pretati is a really helpful app. Whether you have existing Spanish language experience or you are a complete novice, this app is a great resource. Spanish Pretatiis compatible with iPhone 3GS, iPhone 4, iPhone 4S, iPhone 5, iPod touch (3rd generation), iPod touch (4th generation), iPod touch (5th generation) and iPad. Requires iOS 5.0 or later. This app is optimized for iPhone 5.